One week has past since I have arrived in Cairns, Australia and it has been busier than I possibly could have imagined. Cairns is known as the “Adventure Capital of Australia,” and the city lives up to its reputation. The city itself is a northern coastal town surrounded by beaches, marinas, and water on one side and mountains on the other. The city has a similar feel to Florida beach towns in many ways with open air restaurants and bars right on the water, as well as a multitude of tourists. As I took evening walks downtown I passed groups of people speaking languages from across the globe, many of which I could not recognize. 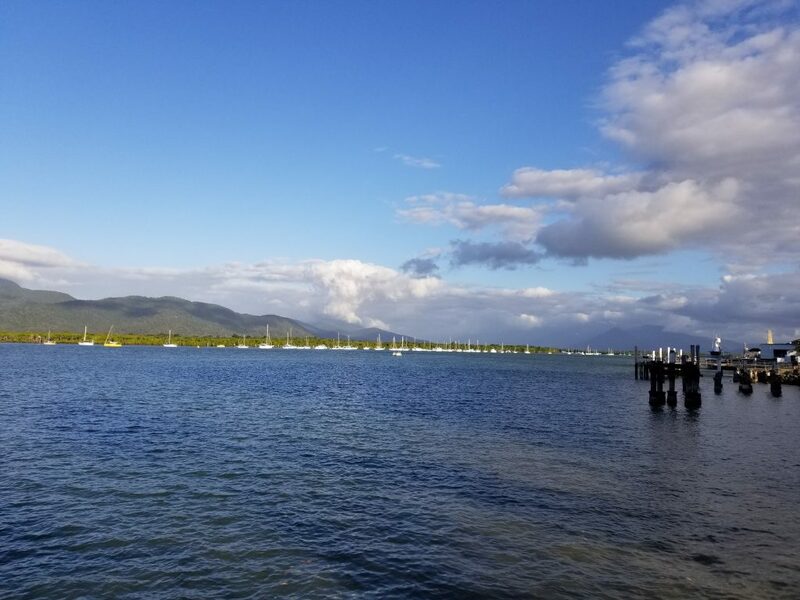 Unlike Florida, however, the people and tourists of Cairns do not go to the beach when they want to cool off, rather, they have a city lagoon which is similar to a massive public pool in which the residents of the city can swim. The reason for avoiding the beaches of Cairns is that they are filled with saltwater crocodiles, jellyfish of many varieties, including box jellys, stonefish, and sharks, just to name a few. Fortunately, Cairns has plenty to offer without going to the beach. On my second day in Cairns we went out onto the Great Barrier Reef to go snorkeling and scuba diving. Never in my life have I been filled with so much awe and sadness at the same time. 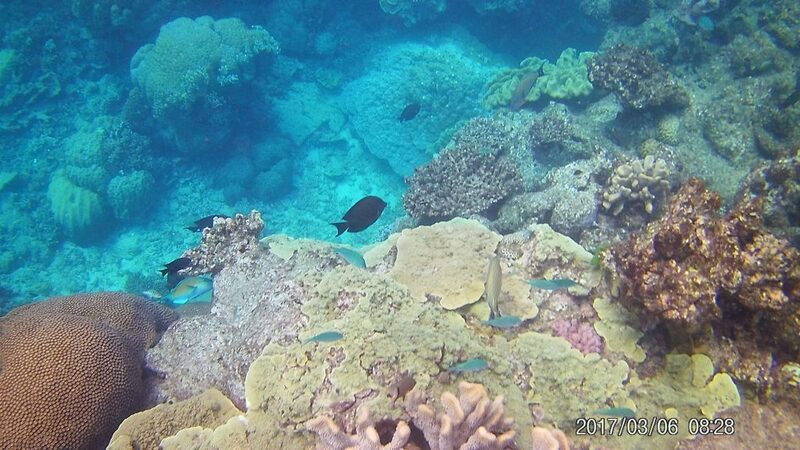 The reef was a thing of beauty with fish and coral of all shapes, sizes, and colors. Angelfish, parrot fish, regal blue tang fish looked like the glittering lights of a Christmas tree as they swam by me. 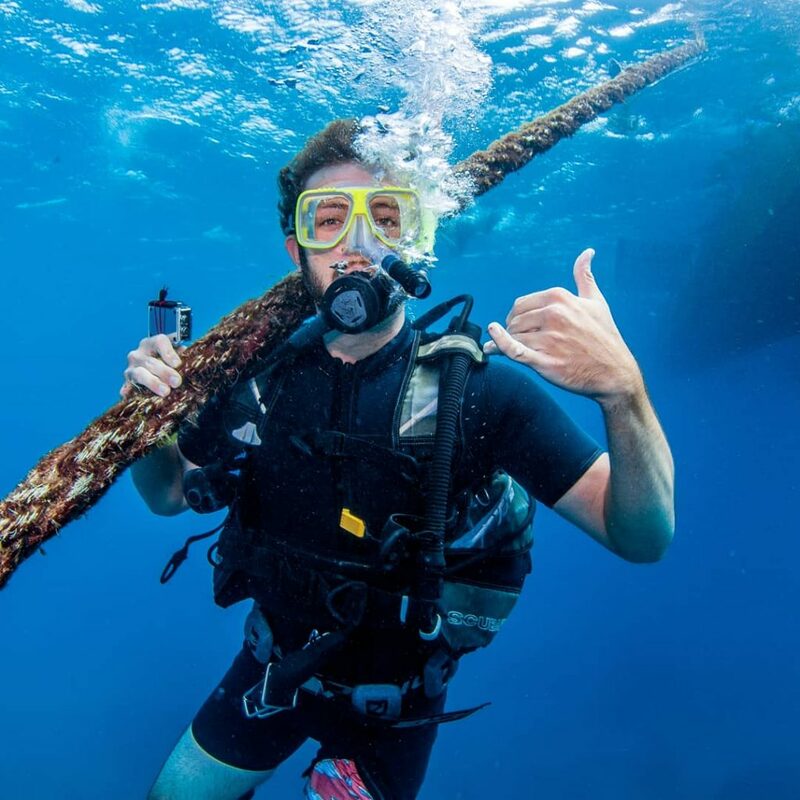 Unfortunately, the reef also is no longer what it used to be as a result of environmental destruction. Reef bleaching has sucked out so much of the vibrant colors of the reef, and although there certainly were areas of breathtaking beauty, significant portions of the reef looked more skeletal with white coral being contrasted with a bright spot of nearby color. The marine biologist aboard our ship told us that it is projected that within the next five years there will be more plastic in the world’s’ oceans than there are fish, and that coral grows at the rate of centimeters per year so destruction to any portion of it could be the destruction of decades of natural growth. Even seemingly small things like sunscreen could damage the reef and we were instructed to apply sunscreen at least a half an hour before entering the water. 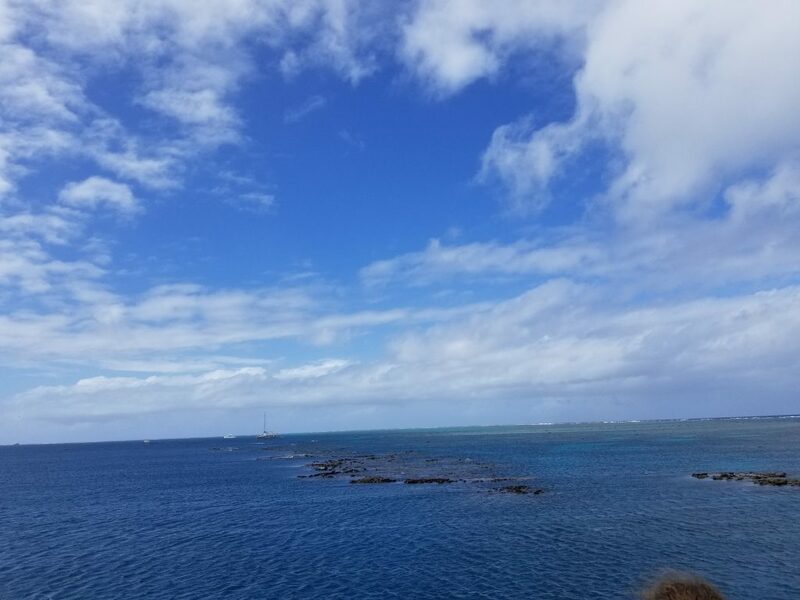 It was humbling to realize that a living structure the size of Japan could be simultaneously so fragile, and it gave me a greater understanding of environmentalism. 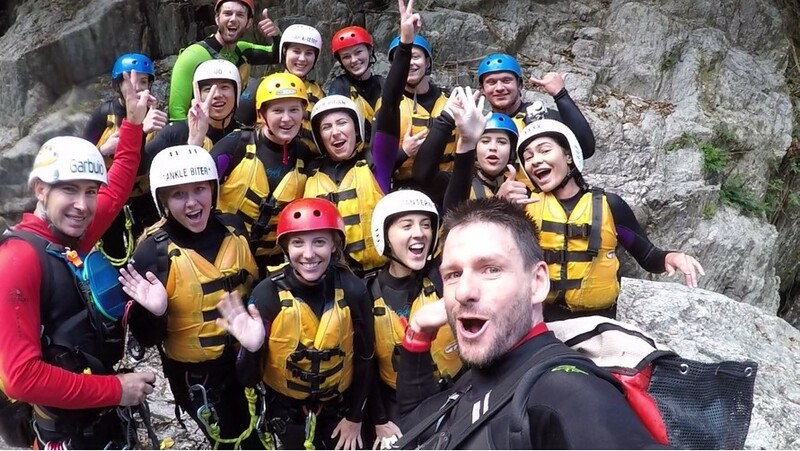 On day three, I had the opportunity to go canyoning in Crystal Cascades with a group of others and our tour guides which was wild! Admittedly, I felt a bit dorky at first as we pulled up into the park wearing wet suits, helmets, and harnesses, meanwhile we walk past little kids and their parents simply wearing bathing suits. Crystal Cascades is a waterfall and river system which provides the drinking water for the city of Cairns. At certain points in the river that becomes wider, deeper, with a weaker current and the locals use those places like an all natural swimming pool. After we passed all of the families, we arrived at a massive gate with barbed wire wrapping across the top. The guides led us through and we started a hike up an incredibly steep hill. 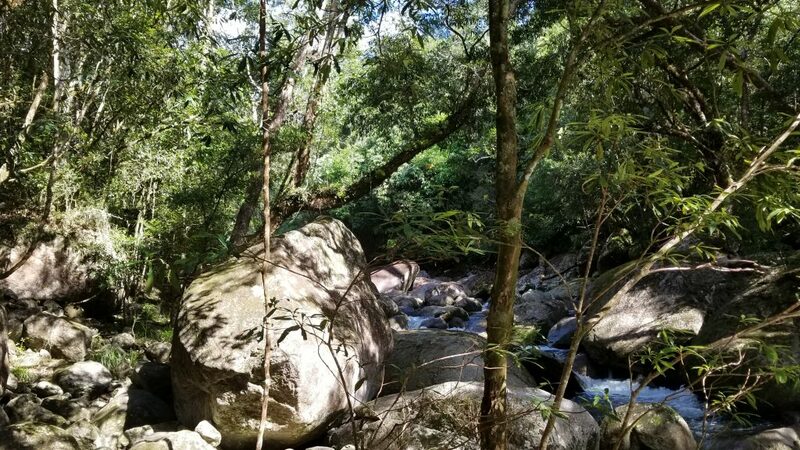 Once we made it to the top of the hill we began canyoning down which consisted of abseiling, cliff jumping, swimming, and zip lining down the river/waterfall system to the bottom. 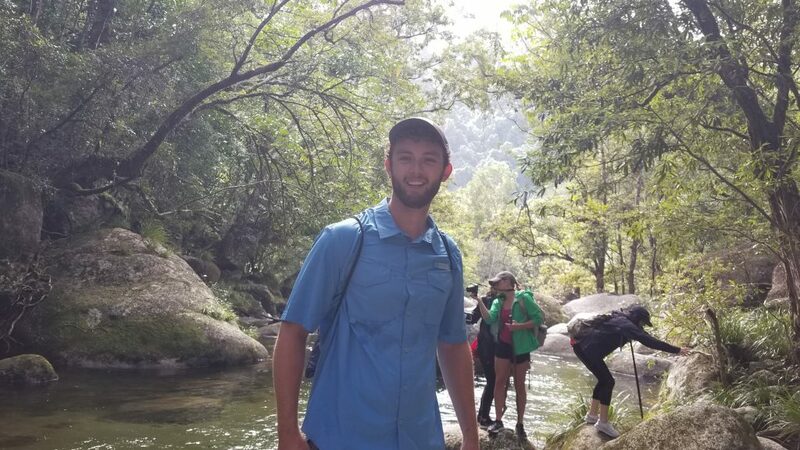 The entire experience was simply amazing as we scaled down waterfalls in a gorge surrounded by the Australian rain forest. Needless to say, I was quite happy for the safety equipment that made me feel so foolish earlier, particularly helmet as I slipped going down one of the main waterfalls and slammed into the side of the cliff. 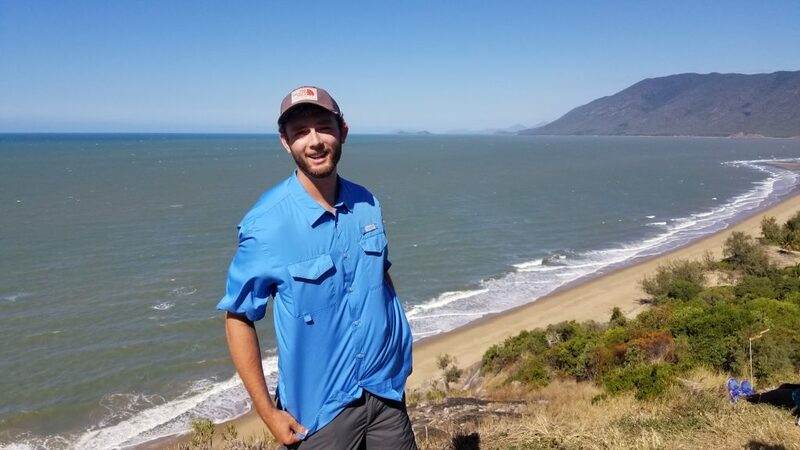 Finally, on day four I went into Daintree Rainforest with an aboriginal tour guide as he taught us both about his culture and about his land. Before we started our hike, we were asked to join in a smoking ceremony where the guides made a small fire underneath a cover so that the smoke would billow out onto which we were told would protect us from any danger as we entered the forest. 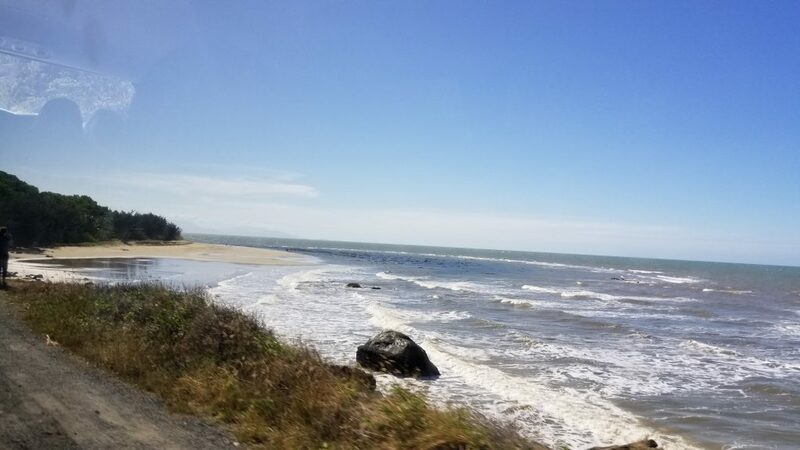 My guide, Skip, once again mentioned how the Daintree Rainforest is the world’s oldest rainforest and that it is the only rainforest that has never had any primates other than humans. As a result, the fruits in Daintree are far more toxic than the fruits found in other rainforests around the world. Skip also taught us about stinging plants in Australia and how they have tiny hairs on the leaves which is embed into your skin and sends four different toxins into your muscles (one of which scientists have yet to discover what it is!) when they are touched and the needles can stay embedded in your skin from anywhere between two weeks to two years! I made sure to take careful notes regarding what that plant looked like in order to avoid it in the future. Skip also told us about how the aboriginal people would use barbed vines as hooks and fishing line when they went fishing. He also told us about how the aboriginal people would use glowing mushrooms to allow them to see when hunting at night, which I thought sounded like something straight out of the movie Avatar. Skip then took us to a river which ran through the rainforest and he told us that this river was the water supply for the city and it was entirely safe to drink which naturally led to all of us students filling up our water bottles with the river water and I must say it was fantastic. 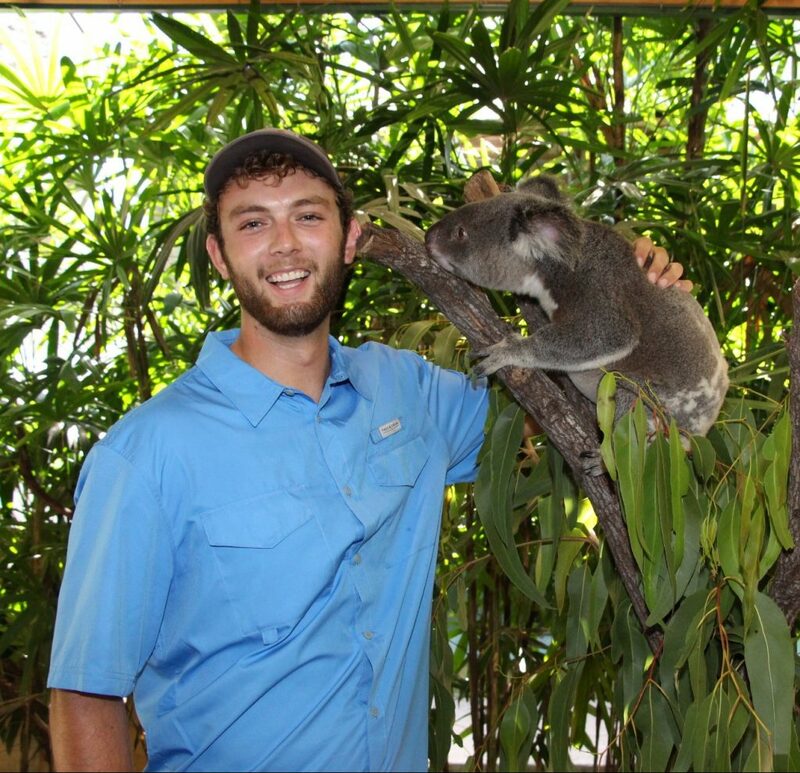 After finishing our hike through the rainforest we went to a wildlife reserve where I was able to get up close and personal with a lot of animals native to Australia. 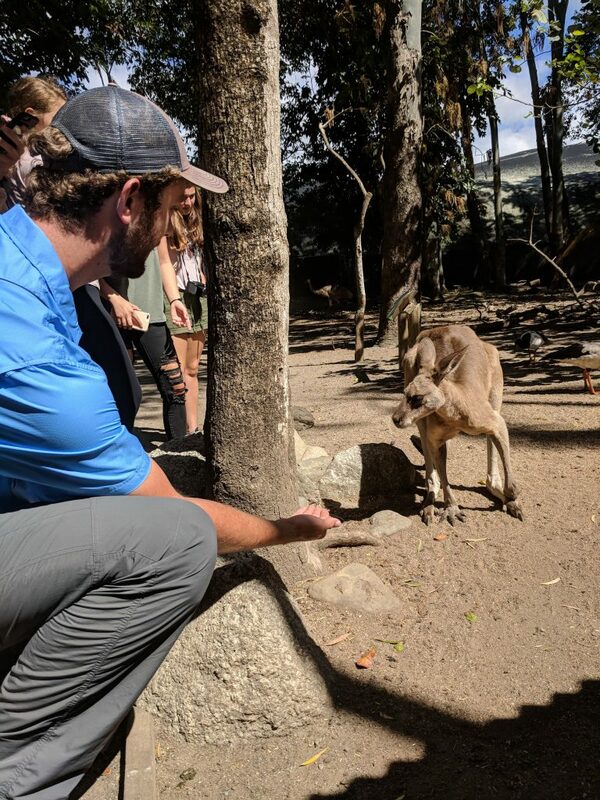 I had the opportunity to feed wallabies and kangaroos, as well as pet a koala and see other animals like emus and cassowaries. At the end of the week, all of the students who were apart of my program said our goodbyes and made our way to our respective universities across Australia. This first week has been busy, and action-packed, and it has felt like something out of a dream. As my plane took off to Sydney and I watched the mountains and rainforest shrink in the distance, I couldn’t help but feel tremendously grateful for the opportunity that I have been given to study abroad. At times it has been difficult for me to comprehend the reality of the whole situation because I am quite literally on the opposite side of the planet right now and having experiences that I have only previously dreamed of which have each been incredible! Now off to Sydney to see what Australia’s biggest city and the home of my new university has to offer! Previous Previous post: Paris Reflections!